Virtua’s Marlton Medical Center offers comprehensive health for urgent, primary, and specialty care. The facility houses offices for holistic primary care, women’s primary care, integrative medicine, ankle and foot care, and sports medicine. Built with the local community in mind, increased access to care delivers on Vitrua’s credo: Get well, be well, stay well. The multi-care facility was given a clear entrance point and opened in order to organize the previously compartmentalized structure which was once a bank and then a hair salon. On the lower level, with no available natural light and difficult floor-to-floor heights, volume was achieved by increasing visual access. Urgent care was placed on the first floor to help new patients get quick access to medical services without difficulties in wayfinding. Private space was once again centralized to encourage collaboration across doctors, nurses, and support staff—an integrated and innovative design of Virtua’s urgent care brand. 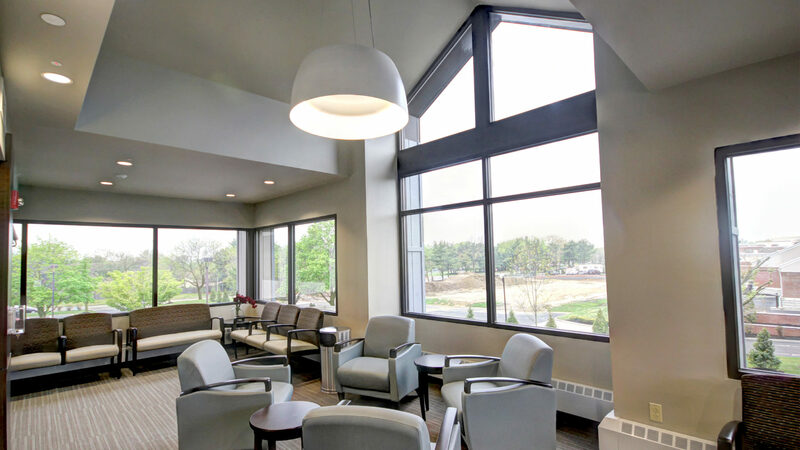 The third floor showcases a spacious waiting area with high ceilings, large windows, and lots of natural light to incorporate hospitality and invite comfort to patients. The goal was to incorporate many individual languages into one cohesive Virtua brand. The facility provides access to comprehensive care and helping people live healthy lives. With a clear entrance, easy navigation, and multiple services in one building—the Virtua language translates seamlessly through recognizable public spaces, vibrant color palettes, and thoughtful accommodations that bring comfort to patients. “We believe every interaction is an opportunity to build relationships and loyalty through listening, anticipating needs, collaboration, and engagement. That’s what we’re about and why we build facilities like this—why we serve the community,” said Virtua’s executive vice president of strategic business growth and analytics, Al Campanella. The center encapsulates Virtua’s expanding and deepening roots to their community and client base.